Digiflavor Pharaoh Dripper Tank Review - Daily Vaping Deals & The Best Vape Product Reviews at Vaping Cheap! The Digiflavor Dripper Tank is a collaboration between Digiflavor and Rip Trippers. Rip Trippers is one of the most popular YouTubers who reviews vape products! This is his only project with Digiflavor currently. Digiflavor is a co-brand of GeekVape, who is one of the most popular companies as of right now! GeekVape is best known for their Griffin RTAs, and Tsunami RDAs! This style of atomizers, where there is a reservoir underneath the build deck has become extremely popular as of late, and the Pharaoh has its own unique spin on how it works, which we will dive into later. In this review, I will give you my overall thoughts about the Pharaoh Dripper Tank, and whether or not I think it’s worth purchasing! Upon first receiving this atomizer, the first thing I noticed is how great the black color looks! I choose the black color rather than the stainless, as this is something I do prefer. I have not seen the stainless steel version in person, but I can say that the black version definitely looks great! It is also worth mentioning that the packaging itself is well designed, even though this is something small, I do think it is worth mentioning. The next thing I did notice when taking it out of the packaging is that the Pharaoh is quite large in comparison to other atomizers that are similar. It was not too large, but it was definitely on the larger side. The overall diameter of this atomizer is 25mm, so I already knew it would look great on larger box mods, or box mods that would sit this size of atomizers flush. Included in the packaging, right next to the Pharaoh is an extra drip tip. This extra drip tip does not have the spit back protection, but it is definitely a nice addition. Some people may not prefer the drip tip with spit back protection, so this is surely a huge pro. Underneath the Pharaoh you do receive a bunch of extras. The extras consist of a ton of o-rings and a multi-functional screwdriver. One thing I did notice though was that the threads were a bit rough when unscrewing the chamber section. With some e-liquid applied to it, it did become better and screwed into place effortlessly. However, once the chamber section was unscrewed, it revealed the deck section. Honestly, it looks easy to build on and is something I will get into later on in this review. The springs in the clamps were slightly stiff at first, but once unscrewed it loosened up and were perfectly fine. The airflow control system is seriously great. It is on one side, and clicks solidly into place. Literally, wherever you set this airflow to, it is not going to move. This was a huge pro, when first looking over this atomizer. Something else I noticed when first receiving this product is that it did have a scent of machine oil. This is something definitely worth mentioning, and is a con to this atomizer. Even though this is a con, one wash with soap and water did clear the small amount of machine oil residue that was present. Overall, my first impressions of the Digiflavor Pharaoh Dripper Tank were positive, even though there were a couple slight cons mentioned. Both of these cons were easily resolved, but like said before, definitely worth mentioning. 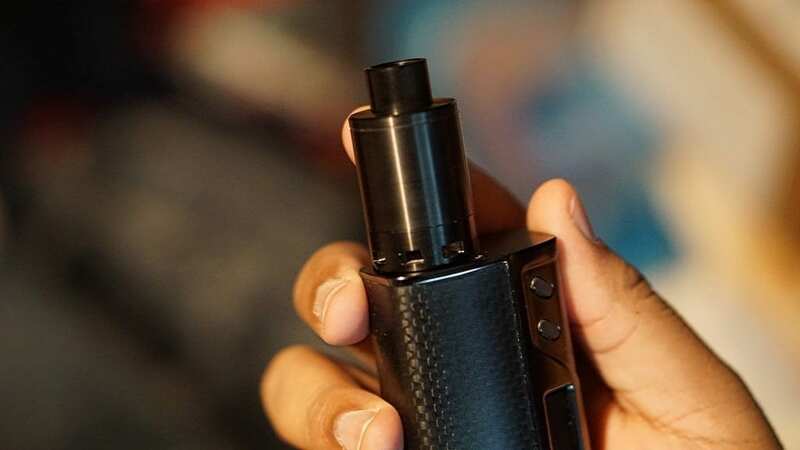 This is something that many people probably want to know, how easy is it to build on this atomizer? Well, it is definitely easy to build on. The clamps stay up when unscrewed, so it makes it easy to just install your leads, and just screw them into place when positioned properly. The springs have a nice tension to them, and do not feel cheap whatsoever. The quality of the Pharaoh is definitely above average. Whether you want to build dual coils or single coil builds, it is simple and quick with this build deck. Honestly, this is probably one of the easiest build decks to work with aside from a velocity styled deck. I have not experienced the screws clipping my leads or anything like that, which is another huge pro. I know this is something that annoys a lot of people, so with this atomizer you will have no worries with this specific issue! Wicking this atomizer is also very easy. All you have to do is cut your cotton to just past the deck section, fluff it out a bit and gently tuck them into the tank section. There is the hinge to close off the tank section, which secures the e-liquid. 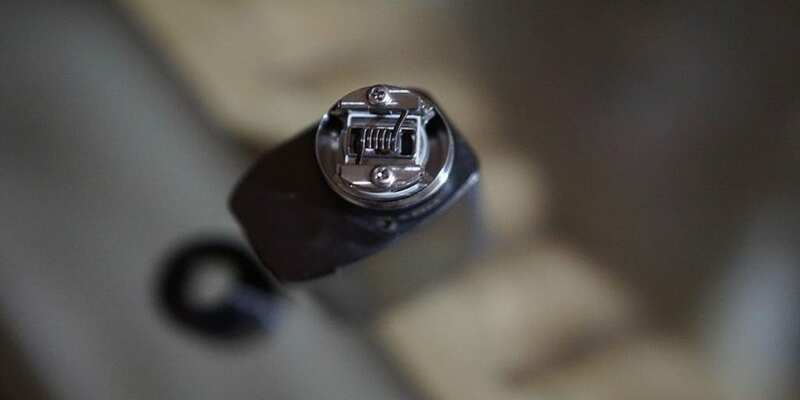 Your coil is being fed e-liquid from the reservoir section below, and with fluffy cotton, it wicks great! I do not recommend closing the hinge shut all the way, as you want your cotton to lay there without much restriction. I found that with this way, it does wick more efficiently. Overall, building on the Digiflavor Pharaoh is easy, and quick. You can throw in a single coil or dual coil build within minutes. The screws have not stripped on me, and the quality is definitely there. 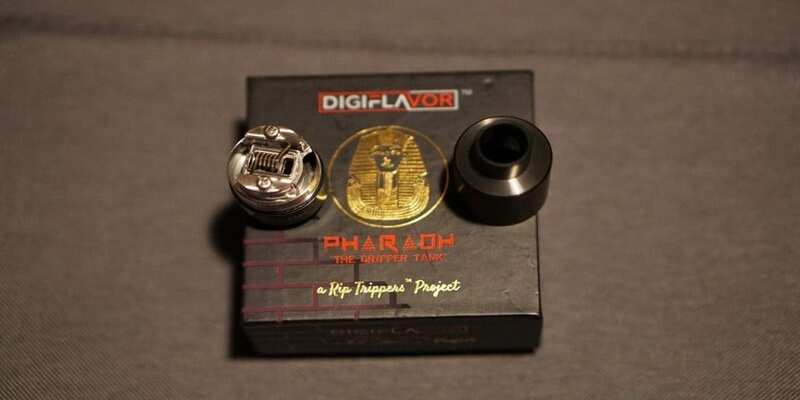 This is probably the biggest question, well how does the Digiflavor Pharaoh Vape? I can tell you that it vapes great! There are a few things to mention though, which I will get into down below. The first thing I noticed when vaping this atomizer is how strange the airflow feels since it is only on one side. I have not seen anyone notice or mention this in reviews, but I typically vape on atomizers with airflow from two different sides. With this airflow being on a single side, it was definitely something to get used to. Honestly, I cannot explain it well, but it was something for me to adjust to. I do not think it was a bad experience, but it was certainly different than what I am accustomed to. However, I can say this airflow is smooth and not turbulent in any way. I would have the airflow wide open typically, as I felt it was the perfect amount of restrictiveness. Personally, I am not a fan of this style of drip tips, so I was glad they included the extra. However, with a fused Clapton build, you do sometimes get spit back, but not an obscene amount. Now let’s talk about flavor. The flavor on the Pharaoh is definitely above average. Probably, one of the best flavors I have gotten out of any type of tank or RDTA. It was definitely a saturated vape, and was satisfying. Of course, this can surely depend on the build you have in your atomizer, which is something I will get into next! The best build I found for the Pharaoh was a single fused Clapton. I did try dual coil builds, but honestly a larger single coil build with slightly more wraps was much better in my opinion. The resistance of my preferred build was 0.32 ohm, and I typically would vape this build around 55w to 70w. The vape I got from this build at these wattages was certainly satisfying. The flavor and vapor production from this build was excellent. However, with a build like this, it can certainly go through plenty of e-liquid. I did have to refill quite often, but not too often. Since the reservoir is only 2ml, you can surely go through it quickly, especially if you chain vape. The drip tip I used was the one without the spit back protection. Honestly, I did not really notice any substantial spit back while vaping the Pharaoh, so I did not feel it was necessary. Overall, the performance of this atomizer was excellent. I always got a satisfying vape from the Pharaoh Dripper Tank. Even though the vape quality is great, there are a few cons I will mention, which I will get into next! There are a few cons to the Digiflavor Pharaoh Dripper Tank. There were a few already mentioned such as the small amount of machine oil, and the initial rough threading. However, another con is filling the reservoir section. Now I did see you can fill the tank section by tilting the atomizer, and dripping e-liquid in a certain angle from the drip tip. You cannot really do this well with the drip tip that has the anti-spit back protection, so you will have to use the other drip tip included. I do find that it is best, and most reliable to fill the tank section by unscrewing the chamber section. This is definitely a con, as some people may get annoyed with this. I personally did not have to fill too often, so it was not a huge con for me, but certainly worth mentioning. Since filling the Pharaoh is not the easiest, especially in comparison to RTAs or other RDTAs, I would not really recommend to use this atomizer outside of the house. You can, but not for long drives or trips, because you would probably need to fill it often due to its e-liquid capacity. If there was an easier fill method, I would highly suggest using this atomizer anywhere, but honestly I don’t really take this out of the house much, especially if I know I will be driving for a long period of time. However, if I’m just going out quickly for errands, I sometimes take the Pharaoh with me. Another subjective con is that you cannot use your 510 drip tips. My Pharaoh did not include a 510 drip tip adapter. This was not a big deal for me, as I typically do not use 510 drip tips. However, I know many people prefer to, so it is worth mentioning for sure. Overall, the Digiflavor Pharaoh does not have much cons. The biggest con is filling the reservoir, and even though it can be a pain, I do think the vape experience you get from this atomizer is definitely worth the trouble of filling! In conclusion, the Digiflavor Pharaoh Dripper Tank is a great atomizer. I have had the pleasure of owning this atomizer for quite some time now, and have been thoroughly impressed. There are some cons to the Pharaoh, but honestly the pros definitely outweigh them. Filling the tank section can be quite annoying sometimes, especially when chain vaping, but the quality of vape you get from this atomizer is excellent. The Pharaoh is extremely easy to build on and just as easy to wick. Installing your build and wicking this atomizer can literally be done in minutes. The airflow on this atomizer, even though it was an abnormal experience for me at first, is great. It is nice and airy, but not too airy. Adjusting this airflow is easy, and once it is adjusted, it’s certainly not going anywhere. The vape experience is just amazing on the Pharaoh. It is extremely flavorful, but it certainly does not lack in vapor production! Like said before, my favorite build for it is a single fused Clapton, and it just performs amazingly. I literally can go on and on about the vape quality, it’s that good. If you are using builds like the one mentioned above, please use high drain batteries, and have an understanding of ohms law. I do have another article that you can check out right here that goes over battery safety! You can also click the link below if you are interested! Click Here for the Battery Safety Article! All in all, even though there are some cons to this atomizer, they certainly are not deal breakers for me. I know for some people, the filling method is probably going to be a deal breaker, but for me it surely wasn’t. I highly recommend the Digiflavor Pharaoh Dripper Tank to anyone wanting a great vape experience. It is easy to build on, so it is not too unforgiving for beginners, and just a breeze for advanced users. If you have been on the fence on buying this atomizer, honestly take the chance! I hope this review has helped you make a decision on whether or not to purchase this atomizer. If you currently have one or have any questions, feel free to let me know your thoughts or questions in the comments section below!